So to give my left shoulder more breathing room I again today went with cardio, opting to put in a solid 30 minute session on the Concept 2 rower. You may recall I just did 20 minutes on the rower yesterday as part of my row/ride brick. I had never done consecutive days of the movement. It did not feel great. To increase my discomfort level I figured out how to set and add a pacer boat to the LCD screen. 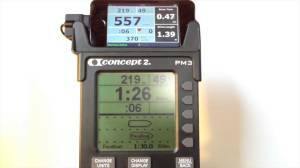 I set it to a 2:15 per 500 meter pace which it maintains constantly throughout your rowing session. I thought it would be fun to add a little graphical motivator on screen. I was wrong. The entire 30 minutes I had the pacer boat by my side pushing me to row harder than I felt comfortable doing. However seeing the nose of my imaginary opponent inching closer to my boat was maddening. In order to keep my pace on point I had to be focusing on the LCD screen almost the entire time. If I looked out the window or up at the tv my pace seemed to always decline although it felt like I was working just as hard. Of course the pacer did it’s job , pushing me to my best 30 minute performance on the rower of 5699 meters but man, it was miserable. I don’t believe I will be using a pacer for every workout.